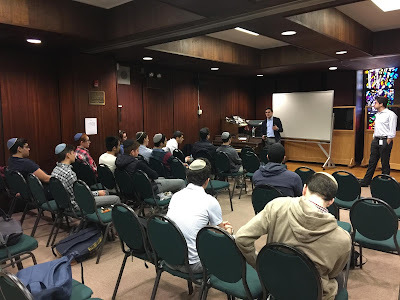 On Friday, December 30th, alumni Abe Sutton and Aaron Senior spoke about their experiences in the consulting industry with Yeshivah of Flatbush juniors and seniors. After giving an introduction to the profession and detailing some of their past work, Abe and Aaron answered student questions on a range of topics including why they decided to go into consulting and how to break into the industry. Bio: Aaron Senior, a YOFHS grad (2011) is a business analyst at McKinsey & Company, serving clients in state and federal governments on strategy redesign and operations optimization. He graduated from the University of Pennsylvania in 2016 with a BA in history and political science. At Penn, he served as the chair of the orthodox community and the head of an education non-profit. He also spent a gap year in Israel at Yeshivat Har Etzion (Gush) after high school. Bio: Abe Sutton, a YOFHS grad (2010) is a senior business analyst at McKinsey & Company, serving clients in the healthcare and public sector spaces on strategy, financial and organizational issues. He graduated from the University of Pennsylvania in 2014 with a BA in political science and a BS in management and healthcare management and policy. At Penn, he served as Student Body President and founded the sephardic prayer group.